Multiple Sclerosis Marijuana Benefits | Medical Marijuana Inc. Multiple sclerosis (abbreviated MS, also known as disseminated sclerosis or encephalomyelitis disseminata) is an inflammatory disease in which the fatty myelin sheaths around the axons of the brain and spinal cord are damaged, leading to demyelination and scarring as well as a broad spectrum of signs and symptoms. Disease onset usually occurs in young adults, and it is more common in women. It has a prevalence that ranges between 2 and 150 per 100,000. MS was first described in 1868 by Jean-Martin Charcot. MS affects the ability of nerve cells in the brain and spinal cord to communicate with each other. Nerve cells communicate by sending electrical signals called action potentials down long fibers called axons, which are wrapped in an insulating substance called myelin. In MS, the body’s own immune system attacks and damages the myelin. When myelin is lost, the axons can no longer effectively conduct signals. 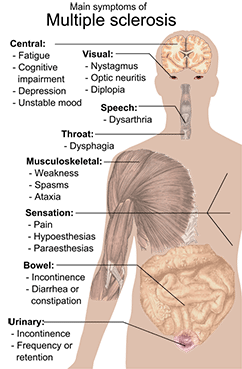 The name multiple sclerosis refers to scars (scleroses—better known as plaques or lesions) particularly in the white matter of the brain and spinal cord, which is mainly composed of myelin. Although much is known about the mechanisms involved in the disease process, the cause remains unknown. Theories include genetics or infections. Different environmental risk factors have also been found. There is no known cure for multiple sclerosis. Treatments attempt to return function after an attack, prevent new attacks, and prevent disability. MS medications can have adverse effects or be poorly tolerated, and many patients pursue alternative treatments, despite the lack of supporting scientific study. The prognosis is difficult to predict; it depends on the subtype of the disease, the individual patient’s disease characteristics, the initial symptoms and the degree of disability the person experiences as time advances. Life expectancy of patients is 5 to 10 years lower than that of the unaffected population.